A few years ago I sat in the stands at CenturyLink field in Seattle to watch a meaningless friendly between Seattle Sounders and Chelsea. These MLS friendlies against European teams on preseason tours amount to little more than exercises in marketing, and really, that game was no different. The Sounders got beaten 4-2 by a mix of Chelsea’s youth team players and big names trying not to pull any muscles. Every once in a while, though, there were glaring reminders of the gap in quality between the two sides. On that occasion, a lot of those reminders happened to come from Romelu Lukaku. Lukaku and his game both seemed larger than life as he bodied MLS starting center backs to the tune of two goals in 63 minutes and then left the field when it felt like he was just getting started. Obviously the stage of the performance warranted more than a grain of salt, but he gave the impression that he was something out of the ordinary. Fast forward to 2015, and Lukaku has strung together two consecutive 15 goal seasons in the Premier League, been to the World Cup, sold for 35 million Euro and is now leading the line for Everton. Though he’s certainly hit some highs over the last two years, this year has gone less smoothly. With Everton struggling and Lukaku bearing a greater attacking burden, he has produced only 7 goals so far, down to 0.28 NPG90 from 0.53 last year. He’s come under some considerable scrutiny for his play this year, and people are now praising Jose Mourinho’s genius for letting him leave Chelsea and banking the transfer fee. But before we label Everton’s record signing a flop less than a year on, it’s worth wondering whether this criticism is warranted, and what is responsible for Lukaku’s dip in form. Separate entirely from Lukaku’s own performances, consider how much has changed around him at Everton. Last season, nearly 80% of Everton’s midfield minutes were played by Ross Barkley, Gareth Barry, James McCarthy, Leon Osman, and Kevin Mirallas. This year, injuries have hampered Barkley, McCarthy, and Osman to varying extents. Osman has ceded minutes to the inconsistent Muhamed Besic and while Mirallas is still contributing, Everton have struggled to find a consistent option on the other wing, where Gerard Deulofeu caught on last year. This season has left Lukaku playing in front of a midfield in flux, whose performance isn’t matching the level it reached last year, and whose inconsistency has forced him to change roles depending on the circumstances. He also suffers from the same affliction as Mesut Ozil: a large price tag. Similar to Ozil, Lukaku’s performances have been colored by the expectations of supporters eager for constant brilliance now that their club has finally paid for a star. While Everton’s struggles as a team have contributed to Lukaku’s dip in performance, Lukaku has certainly dealt with his own drop in form. Last year, Lukaku’s conversion rate of 14.9% put him in the 83rd percentile among 178 forwards and midfielders who played at least 900 minutes. This year he’s converting only 8.6% percent of his shots, which would have put him squarely in the 50th percentile last year. On the other hand, his rate of shots on target has dropped by only four percentage points, suggesting that his conversion dropoff might be the result of some bad luck. We can examine this in a little more detail by mapping Lukaku’s shot locations. This is something that I and other writers on the site have used to break down in detail the shooting performance of a player or a team. 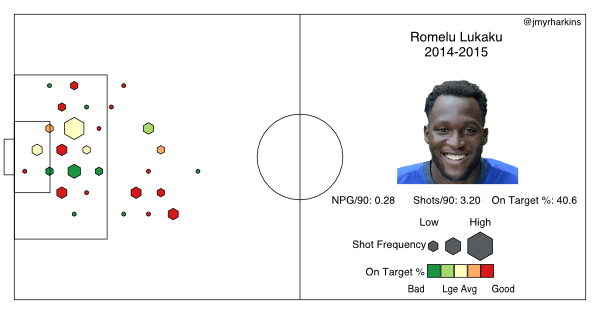 In Lukaku’s case, it becomes abundantly clear that his goalscoring form from last year relied on shooting often and precisely from inside the box. Indeed, all 15 of his Premier League goals came from within the penalty area. This year, however, his shot volume is down from dangerous areas, and more of his shots come from the right side, where he’s more likely to be shooting on his weaker foot. His on target rate from these areas has also suffered. This seems to indicate that Lukaku’s struggles run a bit deeper than just bad luck in the form of regression to the mean. While this trend isn’t encouraging, it looks a little different in the context of Everton’s shooting as a team. Lukaku’s own shot charts mimic those of Everton, whose accuracy and volume from within the penalty area has dropped off this year. Viewed in this context, Lukaku seems to be suffering more from Everton’s attacking dysfunction as a team than an individual inability to generate and finish chances. Romelu Lukaku may not be on fire the way he was last season, but his teammates aren’t helping, and he may take some time to settle into a full-time role as the top striker at a Premier League club. Though some of Lukaku’s struggles are real, panicking about his development now seems very premature. He’s shown flashes where he looks impossible to stop, and his recent Europa League performance rightfully drew a comparison to Marshawn Lynch. It’s easy to forget in the midst of his third season seeing significant minutes in the league, but Lukaku only turns 22 in May. I’m confident that the best is yet to come.